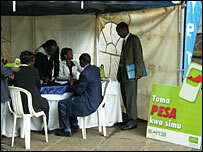 The lives of many Kenyans are being transformed by an innovative mobile phone money transfer service. The free account - M-Pesa - is offered by Safaricom Kenya, a leading mobile phone service operator and is a technological breakthrough say the operators. It enables subscribers to send large volumes of money in an instant transaction. The service, which is in the process of rolling out to most major towns in Kenya, is also cheap - costing on average about $1 to send or receive money. Just a month after launch, M-Pesa is already providing cut throat competition to existing money transfer agencies, notably the government-owned Postal Corporation, a market leader with a massive network of branches. Statistics at the Communication Commission of Kenya, indicate that there are more that 6.5 million mobile phone subscribers countrywide. 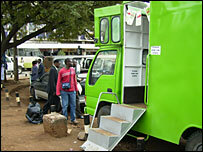 Safaricom has about 5 million customers, and most are expected to be hooked up to the new service in the coming months. The Mobile Commerce Project manager at Vodafone, Susie Lonie, who was in charge of the M-pesa project, says they are now undertaking a pilot in Afghanistan before it can be formally launched there too. Kimani Ngaruiya, a representative of Sasanet, an agency conducting the transfer business on behalf the mobile phone operator says the response has been overwhelming. 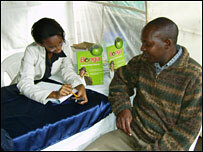 He said: "The roll out has not been completed in Nairobi but the number of people calling at our shops is very high." Sasanet has even introduced a fleet of vans, located at markets, housing estates and busy bus stops in the city to reach more subscribers. A sim card is needed to operate an M-Pesa account. This has a money transfer menu that allows account funds to be managed. "Its simple," said Shella Njeri Thiong'o, an agent at a transfer shop in the central business district. "You just deposit cash to one of our shop and we issue you with e-value cash voucher on your M-pesa account. "The vouchers can be cashed at any appointed agent across the country." Many people applying to become M-Pesa account holders are however concerned over the safety of the whole process, Ms Thiong'o said. "This should not be a worry. Security pin codes are provided and no-one else can access the voucher in an individuals account," she said. Samson Tela, one of the many curious mobile phone users who made his way to the transfer agency, said as much as he was sceptical about the new cash transfer service, it might prove valuable. Most Kenyans living in rural areas exist in abject poverty, most on less than a dollar a day, and have to rely financially on relatives in the cities. Mr Tela works in Nairobi, but his brothers live in Luanda in the west of the country. He said: "My brothers in a rural area depend on me a lot, so each month I have to send some money home." On most occasions, he sends money using postal money orders, but this can be a slow process, which causes him a great deal of inconvenience. "Sometimes when I have to send money urgently, I just package in an envelope as a letter and give it to bus drivers to deliver," he said. "I have lost cash this way in past but I cannot claim a refund as it's just a gamble." The new M-Pesa service proved to be an instant relief for him when he sent $20 to his brother who received the cash immediately from an agent in western Kenya. Sasanet's Karanja Ngaruiya admits there have been a few hiccups as some of the appointed agents in other parts of Kenya have not set up their offices. "A couple of times some people have sent money to places where the appointed agents have not been fully established," he said. "But the money has not been lost - the clients were able to get it back." Micheal Joseph, Safaricom's chief executive, said the idea first started as a trial money transfer service in the micro-finance industry two years ago. The success of the trial project drove the company to explore moving money among individuals across the country. "Within two weeks of the launch over 10,000 account holders were registered and more than $100,000 had been transferred," Mr Joseph said. Plans are under way to test this on an international stage in an effort to tap the large amounts of money transferred to Kenya by its citizens spread throughout the world, Mr Joseph revealed. Statistics show $93bn in remittances is sent by migrants overseas to Africa each year and M-Pesa hopes to tap into this transfer of funds. Mr Joseph said there were still issues to be addressed, such as currency exchange rates, and money laundering laws. "Once this is satisfactory the service will begin," he said. Safaricom, which recently joined forces with other mobile phone service operators in Uganda and Tanzania to expand its coverage in the region, is also looking at expanding the service East Africa to enjoy the service. We have ONETOUCH phone network which is operated by Ghana Telecom. This network has a system which allows users to send "call me back" text messages free of charge. There is also another network, called Areeba which has also a free call me back system, but with limit-100 free messages per month for local and 10 for international calls. This has helped in the elimination of the inconveniences caused when people have no units on their SIM card but they need to make an urgent call. There is an IFAD project currently in Tanzania where farmers who are marketing spies use cellphones to send SMS to other farmers on the farms telling them the day's market prices, This gives the farmers the upper hand when negotiating with middlemen. It has also helped to reduce prices of farm products. IFAD has a radio report on this programme.